The oldest mention concerning the cave – made of Jurassic Superior age limes - is made of the well-known explorer of the Apuseni Mountains, Adolf Schmidl, in the year 1847. He surveyed the cave, making a map and two schematic profiles. The first scientific researches were made by the famous Romanian researcher and explorer, Emil Racoviță, who visited the cave five times between 1921 and 1923. 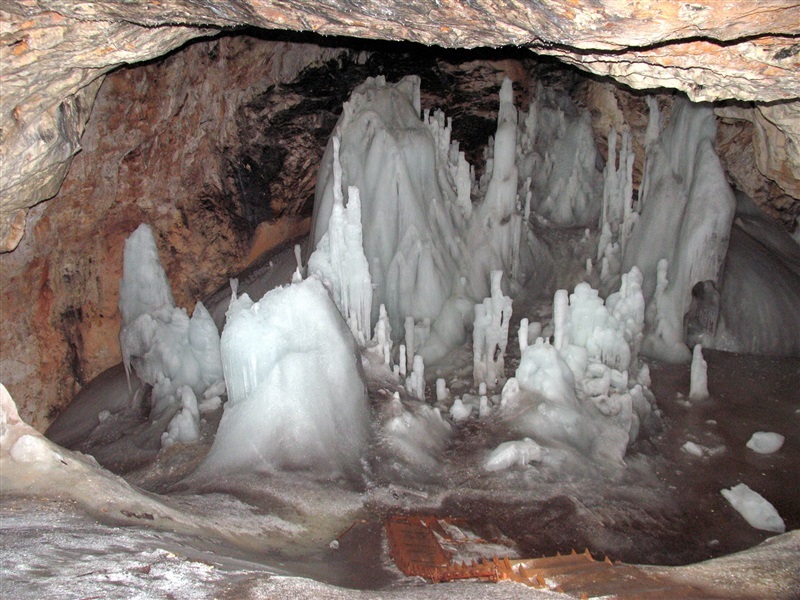 The cave name is given by the Gheţarul de la Scărişoara (Scărişoara Iceberg), an underground ice treasure, with an age of over 4000 years, researched until the present. By the research of many ice cores, collected in 2005, that were studied by many Romanian and foreign investigators, many interesting data were deciphered, such as: how the weather was in the last 4.000 years, when fire burst out in the area, when and how much gold was exploited in Apuseni in the Dacian time, etc. The cave, located at an altitude of 1165 m from the sea level, has a length of over 700 m and is provided with 3 entries. The touristic route implies passing from a shallow-hole of over 50 m and a diameter of 50 m, equipped with metallic stairs. At the basis of the pit is located the “Big Hall” of which floor is an iceberg, occupying a volume of more than 100m000 m3 ice, with a maximum thickness of 36 m, made up of more layers, with ages comprised between 2000 and 4000 years. The ice sculpture of the “Big Hall”, that is fascinating by its beauty, opens the way to imagination and mystery. It is perceived in different ways: some of them consider that it looks like a shark bite, others like being an open mouth bear, or that it would represent a woman with hood holding a child in her arms. The tourist traffic on the ice block is made on wood catwalks equipped with handrails. 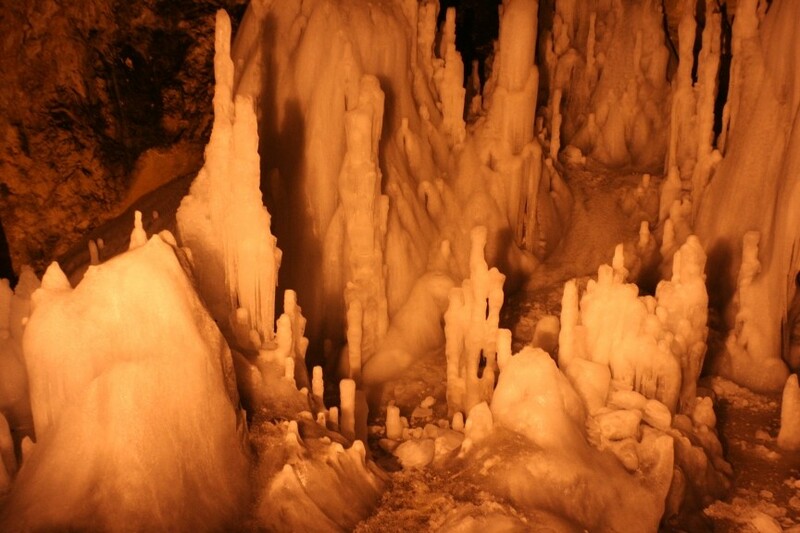 In the N-W parts of the Big Hall, another hall is located named “Church”, from the balcony of which one can admire more than 100 stalagmitic ice formations, flooded in the light of the reflector. Some vertical openings were made up in the ice block and the lime wall, named rimae. Besides the tourist routes, there are also two scientific reservations “Big Reservation” and “Small reservation”, destined exclusively for research purposes.